So yesterday I went to the lumber yard and bought all the wood I expected to need for the lego table. I was pleasantly surprised at the price. 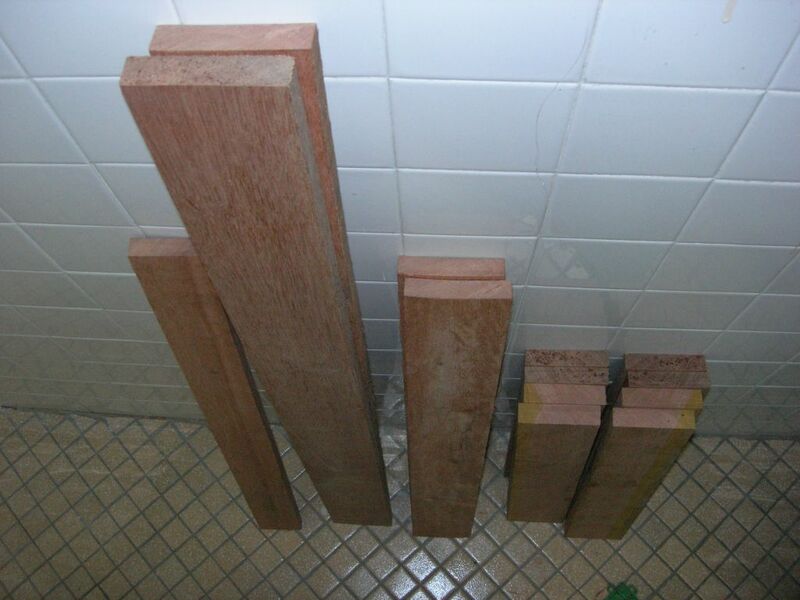 I bought 12.5 board feet of kapur (30′ of 1″x4″ and 10′ of 1″x3″) for $18.25 and a 4’x8′ sheet of 1/2″ plywood for $13.75. I tried to pick boards that were straight and not warped, and at least in that respect, I succeeded. Today I had some good dedicated shop time. My first task was to cut the boards down to the individual components of the table. As I was doing that, I realized that I had neglected to look for one thing when at the lumber yard – cupping. One board was cupped the entire length. Since I don’t have a thickness planer, an electric planer nor a belt sander, I dragged my knuckles over to the “workbench” (a 2″x6″ resting across my japanese sawing trestles) and tried to “knock off the high spots” as I hear people like The Schwarz say. Easier said than done. To the extent that I feel skilled in sawing, I feel that same amount of ineptitude in planing. I guess it doesn’t help that I don’t have a workbench. It also doesn’t help that my irons haven’t been honed in a while. So I got frustrated. Frustrated that my blades are dull. Frustrated that I don’t know how to flatten a board. Frustrated that flattening a board is kind of important sometimes. Okay, often. Frustrated that this quick-and-dirty build of a lego table might take months. But then I chilled out and decided to take a long view of my progress in the craft. Hand plane skills don’t come overnight. I need to think of this as part of the journey. I am considering whether or not to go buy another board to save me time in building this project. That would, however, still leave me needing to learn how to flatten a board. So maybe I’ll stick it out. In the meantime, I now know how I’m going to spend the last of my Tool Fund money: I’m going to get a replacement plane iron/chipbreaker set. I think it will really help me be less anxious about planing. My #4 and #5 planes both use the same size irons, so I’ll be able to interchange them as needed. And I’ll be able to turn my existing irons into specialty blades. Maybe one will be slightly cambered (as will probably the Hock be), and the other I’ll turn into a scrub plane iron. I think I heard one of Matt’s podcasts talking about that. Kind of a rambly post today, but that’s how I feel. A bit discouraged, but at the same time determined to get through it. P.S. Oh – here’s a pic of the parts. Notice the yellow sapwood on what will be the legs. I chose that board partly because it was so straight, but also because, what the hey, let’s see how this ends up looking! Eric – Hang in there and keep at it. You had more success than you might have thought because you know why things were going wrong. You identified the issues that might be causing the difficulty. You’re self assessment was that you needed to look at your blades and you needed to focus on securing the work. In my own experience, the blade sharpness and tune of the plane is the key. Without getting that right, the rest will be struggle. And then you also identified the bench. If the workpiece can’t be held securely, it’s tough to work effectively. So I hope I’m encouraging you to trust your instincts and your knowledge and press on. I feel your pain. I need to make some panels but have two major problems. First, the only wood I can get my hands on is twice as thick as I need, and I don’t have a bandsaw to resaw it. Second, even though I have committed myself to figuring out a way to dimension those boards by hand (including resawing), I have never straightened and flattened a board. I hope very much that experience is the kind of teacher that you hear so much about, but yeah, it can be daunting. The thing that I try to keep in mind is that, no matter how much I want to be able to point at something that I made, the enjoyable part is the process (which includes sharpening). The Village Carpenter has a link to a blog, Dan’s Shop (http://dans-woodshop.blogspot.com), whose owner has gone all in with only hand tools. He has some cool stuff up which might be helpful. I look forward to seeing the table. I think planing is a lot easier to learn than sawing. Anyway, as Keith said, getting your plane properly fettled is key. I can promise you will be frustrated until you get that part down reasonably well. You probably don’t need a new blade to get good results although it would probably be a worthy investment. A new blade might reduce the tendency to chatter, and it might last longer between sharpenings, but it won’t necessarily give you significantly better results. You do need a sole that is flat, a blade that is sharp, and you have to be able to seat your blade so it doesn’t chatter. Also, if you are working tough woods, you will have to put a back bevel on your plane blade. For instance, I can cut southern yellow pine pretty well with a regular 45 degree jack plane. When I switched to ipe, I realized that I needed a much higher angle. At 45, it just sort of splinters ahead of the blade. With a small back bevel, it cuts pretty well. As far as the bench, it needs to be flat, not deform under pressure, and at a comfortable height. You also need something to push against. If you have a block wall, you can often just put a scrap of wood at the end of the piece you are working on so it pushes against the wall. If you are trying to flatten a board and your workbench deforms under the pressure of your plane, you won’t be able to flatten the board. I would guess this was likely the source of most of your frustration. In a pinch, you might be able to see how much your “bench” is bowing down under pressure and put a shim under it. A better method would be to clamp your 2×6 on edge, flatten the edge with your plane and then work (carefully) on that edge assuming you don’t have too long a span between your supports under it. Alternatively (and better yet), you could get several 2×6 boards and glue them together and flatten the top side to have a decent surface to work on. Only the top has to be flat, and the glue job doesn’t have to be perfect. If you don’t have clamps, just put a bolt or screws through it to hold until the glue dries. Hi Eric, I’m trying to learn some of those same hand planing skills that you’re struggling with at the moment. Blade sharpness and tuning do of course matter a lot, but technique is important too. I’m finding that flattening the face of a board isn’t the hardest possible thing to do, but getting the opposite face parallel (ie, the job the is performed so effectively by a thickness planer) is really tricky. You didn’t mention exactly what part of flattening the board you were having trouble with, but here’s what I’d do (and I’m no expert), in the hope that it’ll help someone. First up, looking at your tools list, we’re talking just about your jack plane here. The other ones all get put aside for this. You mentioned struggling with the sharpness of your planes. You’ve got stones up to 8000 grit, and I certainly find that a blade sharpened to only 5000 grit is scarily sharp. Since the board is cupped, I’d lay the concave face of the board on your bench so that it doesn’t rock, and try and flatten the convex side first. The key here is diagonal strokes. When planing something thin (like the edge of the board) then you can just move the plane along the board. However the board is wider than the plane blade, then it’s almost impossibly to get the board flat across it’s width and free from twisting using linear cuts. Diagonal cuts can be rough and ugly. Particularly if your blade isn’t sharp, or if your wood has an open grain, you don’t get a particularly smooth surface. The goal though is for a flat surface at this stage, not a smooth one. I work my way down the board, from one end to the other, making passes with the jack plane at about a 45 degree angle that overlap slightly until I reach the other end of the board. Then, I do it on the other diagonal so that the cuts intersect at about 90 degrees. Because I’m not planing in a straight line, I simple bench stop isn’t enough to hold the wood in place. A proper bench with bench dogs and a tail vice is what is really needed, but you can also do it with a bench stop and another bit of wood clamped along the bench to support the edge of the piece. Traditionally, on rough cut lumber, this diagonal planing is done with a scrub plane. On timber already planed (but not flat) it works fine with a jack plane. The idea is that the diagonal strokes use the flat base of the jack plane to best advantage by providing a compromise between keeping the board flat along it’s width and flat along it’s length. After doing this enough times to fix the cupping, I then take fine passes along the length of the board with the jack plane to remove the rough marks from the diagonal passes. Don’t do this too much, because it’s easy to do it more on one side than the other, and thus render the board unflat. Since this is all flattening work, none of it requires the smoothing plane, and none of it requires a cambered blade. Plane tuning and sharpening is really only an issue if your main problem here is tear-out. So, I’d suggest that you don’t need to run out and buy any more tools, you just need to practice (as do I). You’ve already gotten a lot of good advice on this one, but I’ll add my two cents worth as well. I pretty much follow the procedure that Craig outlined. Sometimes I find that skewing the plane helps. The direction of travel is still 45 degrees across the board, but the plane itself is turned about half-way back to parallel with the board. Another idea is to take a pencil, or chalk and draw lines across the board as a visual guide. If you have the concave side down, then you really want to just focus on removing the ridge that runs down the center of the convex side (assuming it is just cupped and not in wind). I try to hold the plane level and just shave off the ridge. If you are taking a shaving from the edge of the board across to the center, things can get pretty frustrating. You don’t want to be taking a shaving that starts at the edge until the board is pretty flat and then you will be getting shavings all the way across. The pencil lines can help you keep track of what is going on. Also, another trick that might help (especially if you are working with uncambered blades) is to use the lateral adjustment on the plane to make one side of the blade cut deeper – sort of a psuedo-scrub effect. I usually rely on the surface of my bench to tell me when the board is flat. I scrub away, then flip and see if it lays flat or rocks. If it rocks, flip it back over and scrub some more. Once it doesn’t rock, it’s time to smooth and then gauge and plane the other face to parallel. As for the iron, I sharpen with a Scary Sharp setup and love it. I did try waterstones, but to be honest I couldn’t come close to the edge I get with the SS. I was very thankful I didn’t start with them, as I obviously don’t have the knack. AFWIW, all my irons are original, and I have only come across one that had any problems. I am sure a Hock iron would be great, but I don’t think it is necessary. I hope this helps . Keep at it, and keep posting. to stick on the ceiling like that? Wow, thanks everyone for the encouragement and instruction (and for the laugh, Seamus). I also appreciate hearing that I CAN actually do this – and do it well – with the blades I currently am using. Maybe I’ll rethink getting a Hock blade for the time being. @Luke: What do you mean by a “back bevel”? Do you mean actually putting a bevel on the back side of the blade, so it is beveled on both sides? Or are you referring to a double bevel? Many people including myself do put a micro bevel on the sharpened bevel edge to make the blade easier to sharpen. Either way is fine if you get the edge sharp. However, what I was referring to by a back bevel was putting a small bevel on the flat side of the plane blade. Some people just do it as a matter of course. I think it may have been David Charlesworth who really popularized it with the ruler trick, but I am not sure about that. Personally, I prefer to have a flat back and generally subscribe to Stephen Shepherd’s school of thought on this. However, in this case, I essentially needed a 50 or even 55 degree frog to have any chance at success with the Ipe. Since I don’t have one, I honed a small bevel on the flat side of the blade effectively changing the angle the blade meets the wood giving an effect similar to having a plane with a steeper angled frog. The downside is if I want to go back to a regular shaped blade, it will take a bit of work. Hey, thanks for the clarification Luke. Looked like I heard you right the first time, but I had never before heard of putting a bevel on the back. I think that if I get enough blades (like if I buy a hock), maybe I’ll do that on one of them. But right now, with only two blades for the #4 and #5, I think I’ll keep ’em flat on the backs. Maybe turn one into a scrub, and camber the other one for a good smoother. Of course, if this wood really is tough to work with, that might justify getting that Hock. If for some reason you want to change angles somewhat frequently, but don’t want to buy additional planes or blades, a bevel up plane is a better choice since the angle can be changed without monkeying with the back of the iron.